Superman arrives on the planet Nideesi and frees Lex from his cell. They are immediately confronted by L'Call and Zade. There is a brief fight before L'Call shows Superman why he has taken Lex Luthor. Superman watches as L'Call, along with his wife and daughter, flee from a squad of Parademons. Darkseid arrives and kills L'Call's family. After a brief interlude on Earth, where Perry White tells Lois and Other Clark that they need to find the Genetricron building, Superman and Lex are brought before Ch'aar, who reveals Lex's fate as Darkseid's successor. The jury returns their verdict and with all the evidence given even Superman agrees with the fact that Lex Luthor is guilty! Story - 5: Jurgens delivers another character driven issue that I liked quite a bit. I know I've been saying that with all the ACTION issues since Jurgens took over as writer but that doesn't make it any less true. I am invested in MEN OF STEEL on an emotional level and seeing more of L'Call's backstory had a lot to do with that. Some might consider the death of his wife and daughter as a motivating force to be clich�d but it worked for me and that had everything to do with the way Jurgens paced that part of the story. I also appreciated that L'Call was suiting up at the beginning of the issue because he knew that Superman would be arriving at some point. This fleshed him out as a character and made me think of him as something more than a guy with a grudge. The short interlude at the Planet was great as well. I'm a fan of the writer taking a few pages to show us what's going on back home. The Other Clark/Genetricron sub-plot is something that I'm invested in as a reader so seeing this small scene made me happy. I also like that Jurgens gave us a quick glimpse at Jonathan and his friend acting like kids. It made me chuckle. 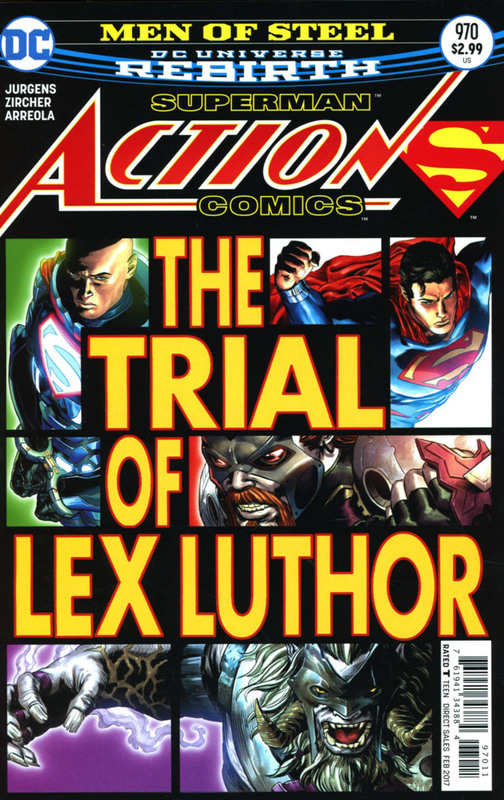 While the action of this story has been entertaining, the philosophical arguments the characters have had are engaging, and the background Jurgens has given to the antagonists have been compelling, the main draw for me as a reader has been the idea that Superman is willing to help Lex even though he doesn't trust him and thinks of him as a villain. This, to me, goes to the heart of who Superman is as a character; a willingness to help everyone even if they are evil. Jurgens is dealing with this idea on a more nuanced level but when you scratch away all the trappings of Superman you have a man that wants to use the abilities he was born with to help all of mankind. While Lex is not weak, nor is he oppressed Superman won't stand by and let two aliens take him off Earth to execute him for something he hasn't done yet. It's just nice to have a Superman I recognize back in the pages of the new comics I read. Art - 5: The art continues to be as strong as the writing in this title. That splash page of Superman flying through space with the various Lexes behind him was a great way to kick off the issue and Patrick Zircher continues to be one of my favorite current Superman artists. He brings life to the characters he draws, whether they are standing around talking or running from Parademons or just fighting in general. He also can draw both everyday setting like an office or a kitchen with the same skill he draws an alien landscape. Zircher also draws one heck of a Darkseid and I loved that he gave the villain a full-page splash to introduce him. Cover Art - 5: I love the design of this cover. It has a real movie poster look to it. Variant Cover Art - 5: Another great variant. 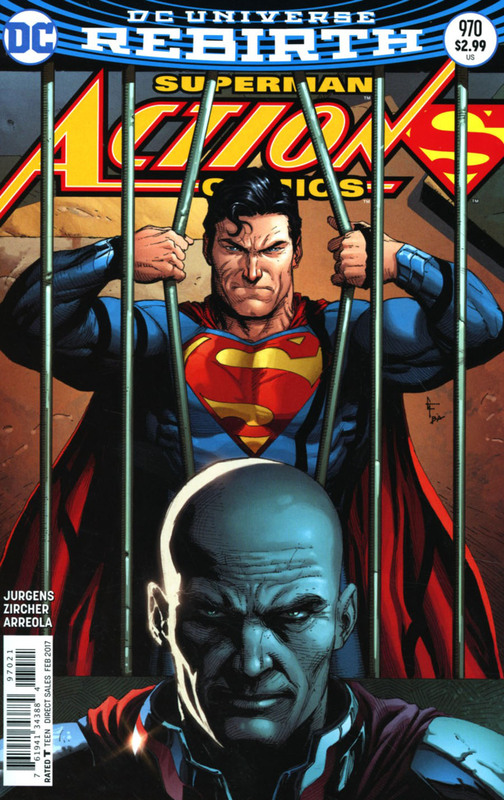 It almost looks like Superman is breaking out of a prison Lex put him in. Gary Frank has yet to disappoint with these variant covers.